Swaziland/Eswatini is so broke that pensions for the elderly are not being paid. State-controlled radio has been broadcasting the news over the past few days. 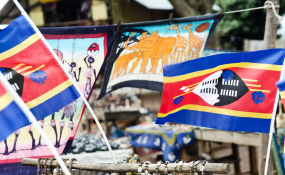 About seven in ten of Swaziland's 1.1 million population live in abject poverty defined as having incomes less than the equivalent of US$2 per day. The report said poverty among people aged 60 or over was highest compared to other age groups. News that elderly grants cannot be paid comes as the new government in Swaziland announced 'cost-saving' measures. At a press conference on Thursday (22 November 2018) Prime Minister Ambrose Dlamini announced that senior government officials would no longer fly first class when they travelled abroad on official business. In future they would go by business class. Swaziland is broke and as of 30 June 2018 owed a total of E12.9 billion, the equivalent of 20.8 percent of the kingdom's GDP. Of that nearly E3 billion is owed to suppliers of goods and services. Meanwhile, King Mswati III who rules Swaziland as one of the world's last absolute monarchs, wore a watch worth US$1.6 million and a suit beaded with diamonds weighing 6 kg, at his 50th birthday party in April. Days earlier he took delivery of his second private jet, a A340 Airbus, that after VIP upgrades reportedly cost US$30 million. He received E15 million (US$1.2 million) in cheques, a gold dining room suite and a gold lounge suite among his birthday gifts. He now has two private planes, 13 palaces and fleets of top-of-the-range BMW and Mercedes cars.